Successfully Added Mini Multimedia Projector with 4 GB Memory + USB Display to your Shopping Cart. Introducing the world's newest Mini Multimedia Projector with 4 GB Memory. Enjoy theater-like screen using this pocket sized mini projector with vibrant picture quality, 4 GB of internal memory and a USB display function that allows you to view videos straight from your computer and laptop. 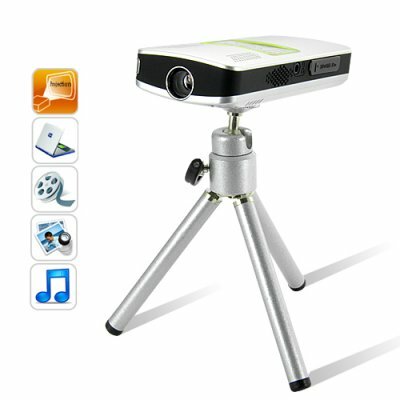 The Multimedia Mini Projector is perfect for any business people, lectures, demonstrators or everyone else. It can be powered by either conventional power adapter or with a rechargeable battery, which is very handy when you need a short demonstration on the go. Furthermore, it comes with a FREE tripod that helps you to setup a professional presentation in no time at all. Why spend triple the price on a medium size pico projector, when this Mini Multimedia Projector will meet all your needs at a fraction of what others cost? Order today and we'll express ship it out tomorrow along with our famous 12 month warranty. Brought to you by the leader in China China Wholesale Electronics - Chinavasion. How long is the bulb life for this mini projector? The life of the bulb for this projector is, on average, 5 years. If there is a problem with the bulb during that time, please contact us. How do I connect my iPhone/iPod/iPad to the Mini Multimedia Projector? You will need to purchase an extra "Apple Component AV Cable", which can be used to connect to the AV cable of the Multimedia Mini Projector. What is the best lighting conditions that the projector is best suited for? All projector should be used in low light, and for best viewing experience use the mini projector in no light. Good for displaying basic stuff, but for gaming or 2D/3D intensive applications you better stick to the RCA output. Oh, and a common mistake when stating the video capabilities of a device: mp4, asf, avi, etc are containers. The important stuff is the supported codecs: divx, xvid, h264, Indeo, etc... In this case, the supported codec seems to be one from Zoran (C10P, according to the included conversion app). All in all, it will do the job as a portable projector. on 2010-05-19 12:44:17 WOW, Buy This! Out of the box, without reading the instructions I was fully impressed immediately. The projector is great at about 24", ok at 50", average room light it is even visible but not great. The AV in works perfectly from the digital camera I bought from Chinavasion last month, better than I expected. Music and photos are easy to use too. A versatile device even if it does get hot - use it for home movies, not Avatar, and it will be fine.